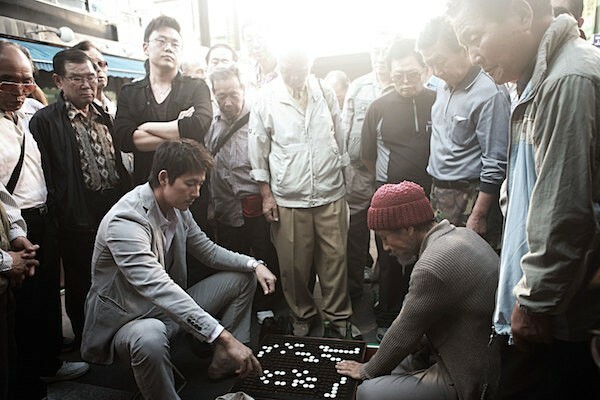 Professional go player Tae-seok loses his brother to infamous underground gambler Sal-soo after losing a high-stakes game in The Divine Move (AKA The Immortal Move) a new Korean film due out next month. Framed for the murder of his own brother and locked up in prison, Tae-seok (Jung Woo-Sung) vows revenge and trains ferociously in Jo Beom-gu’s action-packed drama. After serving his seven-year sentence, Tae-seok gets in touch with his brother’s former associate Tricks, hermit and blind master player Jesus and skillful junkyard owner Mok-su (Ahn Kil-Kang), and begins formulating a plan to get back at Sal-soo (Lee Beom-Soo) and his men. Slowly penetrating Sal-soo’s inner circle and his gambling joint, Tae-seok eliminates Sal-soo’s men one by one. But when Sal-soo discovers Tae-seok’s true identity, one final game will seal the fates of the two men. According to one source, the film’s literal title “Shinui Hansoo” (“God’s One Move”) “refers to a winning move in the board game of ‘Baduk’ (known in the West as ‘Go’), when the opponent is unable to counter and loses.” No info yet on US release plans. Thanks to David Doshay for passing this along.